Implements Subscription API using Call's copy constructor. 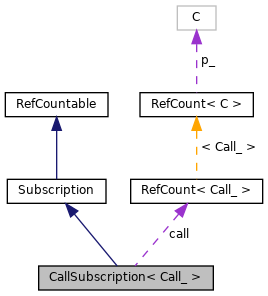 The subscriber creates one of these using a specific callback type and instance. 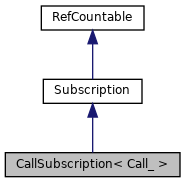 The subscription object is then passed to a producer/factory which will use this API to generate calls. A subscription may be passed to multiple producers. Definition at line 48 of file Subscription.h. Definition at line 28 of file Subscription.h. Definition at line 52 of file Subscription.h. returns a call object to be used for the next call back. Child implementations must ensure the Call pointer produced is not NULL. Definition at line 56 of file Subscription.h.